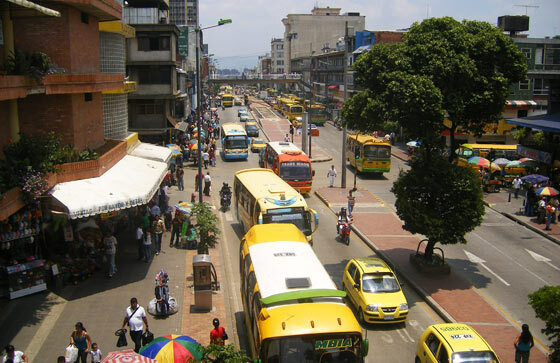 Bucaramanga possesses three strong reputations. 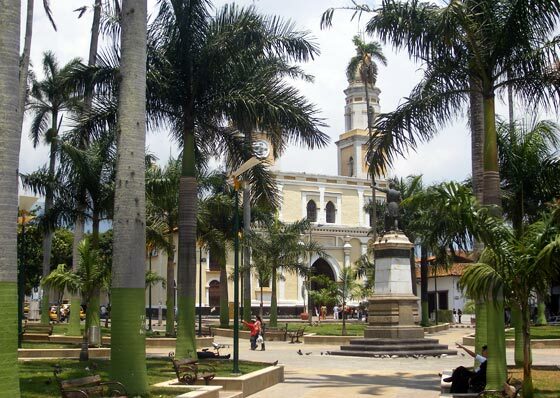 Firstly it is known throughout Colombia as 'The City of Parks' owing to the myriad of green spaces throughout the city. Another of the city's reputations is its distinctive food. Santander as a whole has a reputation for delicious sweets, including the famous 'oblea' (two large wafers filled with a variety of sauces). Possibly even more famous than the sweets, however, is another of the region's delicacies; the 'hormiga culona' (a large fried ant). If you ask Colombians about the people from Bucaramanga and Santander, a large number will tell you that "las mujeres de alla son muy bravas!" (the women are fierce!) To be fair it is generally said more in jest than as a harsh criticism and most people will tell you that 'Santandereanos' are actually very friendly (as indeed they are). 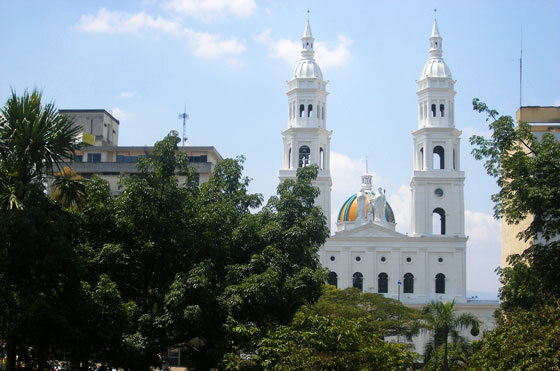 A sensible place to start a walking tour of Bucaramanga is at Parque Santander, the city's attractive main square with a statue of the famous liberator at its centre. 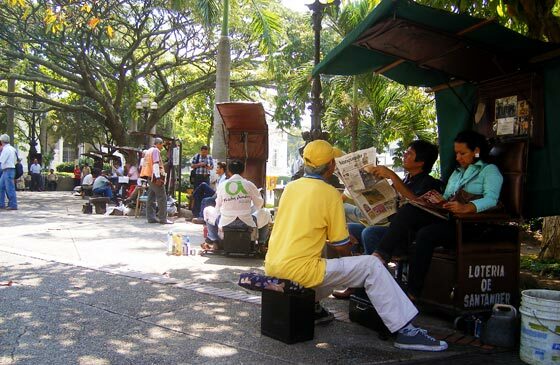 Sit down in the shade of the plaza, buy a newspaper from one of the vendors, sip a 'tinto' (black coffee) and watch as the shoe shiners ply their trade. When suitably relaxed turn your attention to the plaza's perimeters. The plaza's most prominent landmark can be found on its southern side in the form of El Catedral de la Sagrada Familia. Moving around anti-clockwise, on the eastern side of the plaza on Carrera 20 is the Club de Comercio housed in a beige colonial building. Continuing around to the northern side on Calle 35 is Centro Comercial La Triada, the tallest building around the plaza. The vast majority of the floors are used as offices for various enterprises, but the in the open area in the middle of the ground floor is a lovely cafe. Take the elevator up to one of the top floors for decent-ish views out over the northern side of the city. There's no viewing platform but the windowed staircase permits you to look out over the urban sprawl interspersed with some of the city's numerous parks. Especially visible are Parque Centenario slightly to the left and Parque Antonia Santos diagonally to the right (both fairly average parks compared to Bucaramanga's other offerings). The western side of the plaza contains a site of the Universidad Industrial de Santander on the northern corner and a an outdoor cafe called Terraza Café another good place to pitch yourself and watch the world go by. 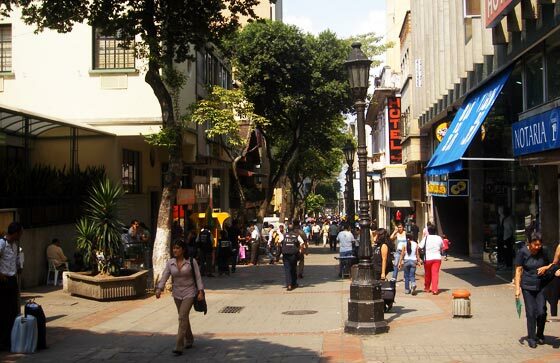 On Calle 35 between Carreras 18 and 19 is a pretty pedestrianised walk. Along this short strip are several hotels (some of which are mentioned below in the accommodation section), cafes and restaurants, and some small shopping centres, the best of which is Centro Comercial Rosedal with a nice little cafe about halfway along the walkway. You can also find most banks in this area. Continue down Calle 35 or cut one block to the left for the wider Calle 36. A couple of blocks down is Centro Comercial Pasaje Cadena (both streets have entrances) which is a good place for bootleg clothes, computer games and general nic-nacs. Note that, although not overly dangerous, you'd be wise to pay a little more attention to your valuables in this part of town. A block further down and you reach Carrera 15 one of the city's main arteries. Here, between Calle's 35 and 36 is the Plaza Central, a large food market. If you're living or self-catering in Bucaramanga, or if you just fancy having a gander at the local produce, this is a great place to come. The first floor is vegetables, the second floor is fruit and 'salpicons' (a kind of fruit salad), and the third floor is meat and fish. Crossing the busy Carrera 15 brings you slightly out of the hustle and bustle and into the city's small colonial district. Stroll for two blocks and you'll see an open paved square to your right on which sits the Palacio de Justicia (Justice Palace). Just up from the Palacio de Justicia is a colonial building called Notaria Septima. This was Bucaramanga's first two-story building. One block further is the pretty Parque Rovira which once marked the centre of Bucaramanga. 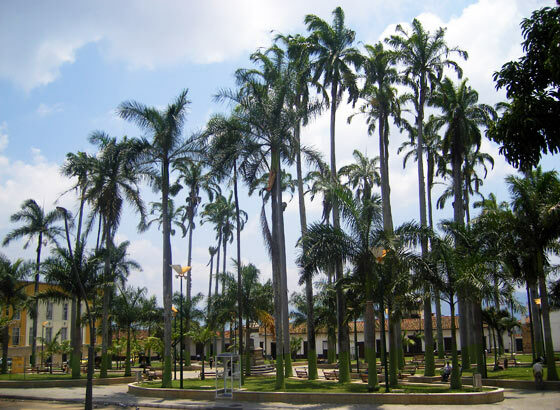 The park's square's tall palm trees provide a nice place to relax while you get acquainted with your surroundings. The tall church on the eastern side of the park is Iglesia de San Laureano. Moving clockwise around the plaza you come to the Gobernacion de Santander, a yellow and beige buidling and on the opposite side of the plaza the Alcaldia (Mayor's Headquarters). 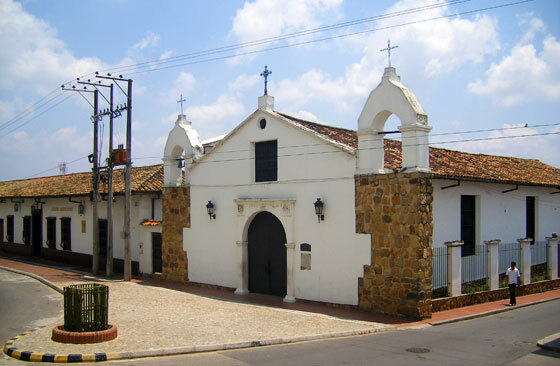 The prettiest side of the plaza, the western side, contains the small Capilla de los Dolores, Bucaramanga's oldest church. Another interesting attraction called La Casa del Libro Total is on the corner of the park between the Capilla de los Dolores and the Mayor's Headquarters and features literature and works of art from local artists. On the outskirts of the city is the small town of Floridablanca, famed for its sweets and desserts. About an hour away is the picturesque colonial town of Giron. Full of cobbled streets and shady plaza, this is definitely a town worth visiting.